You don’t buy an instant camera because you care about photo quality. You buy it because you yearn for a simpler, easier time, when photographs were tangible objects, and cameras came in cutesy colors and swallowed film. Fujifilm’s Instax Mini 70 is the newest addition to the existing Instax cameras. It adds such modern and exciting features as automatic exposure control (!!! ), and a selfie mirror for better framing of selfies. 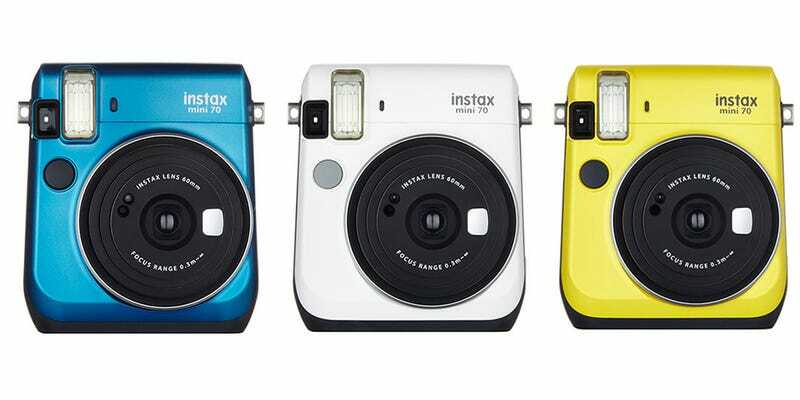 There’s also three different colors: white, yellow and blue, a major departure from the grown-up leather-and-metal look of the Instax Mini 90. Otherwise, the 70 takes the same credit-card-sized Instax Mini film, costing about a dollar a shot. The camera itself is cheaper than the the $200 Mini 90, though, at $140. That’s still a little more than the $100 Mini 50, but for $40 you’re getting a bunch more functionality, and a design that doesn’t look like a third-grader’s first camera project.